Very closely related: How should we deal with people misusing the [Visual-Studio] and [Android-Studio] tags? Visual Studio is an integrated development environment (IDE) from Microsoft. Use this tag if you have a specific question about Visual Studio features and functionality, not just a question regarding your code. Consider tagging the exact technology area your question links to and also tagging a more specific version of Visual Studio. Please mention your exact VS version, edition, and update level in your question. Use for questions about using Android Studio, an official IDE targeted at Android development. Do NOT use for questions about programming for Android in general; instead use [android]. And yet, as discussed on the linked question, the tag is routinely misused (mostly by low-reputation users), which tends to diminish the value of the tag for people who are actually asking tool-related questions. One idea thrown about there would be to create a popup describing the proper use of these tags; I'd like to suggest that as a site feature. This would happen only for low-reputation users and/or the first time that someone used one of these tags. There's no need to include this kind of message for every single tag, obviously, just ones that are routinely misused. For the record, it actually worked - when I saw that, I did, in fact, read the Meta post it links to. Second edit: There are certain tags, such as vpn, openvpn, seo, and a few others that seem to draw a lot of off-topic questions. This is true in spite of the fact that the tag usage guidelines for these often explicitly warns people against misuse. For example, almost all of the questions tagged openvpn are off-topic (the tag is currently subject to a cleanup request), even after the tag usage guideline was updated to state that this tag should be used for programming questions, not for questions on configuring or using VPNs. Point being that people - especially new users - don't seem to read the tag usage guidance too carefully (if at all). 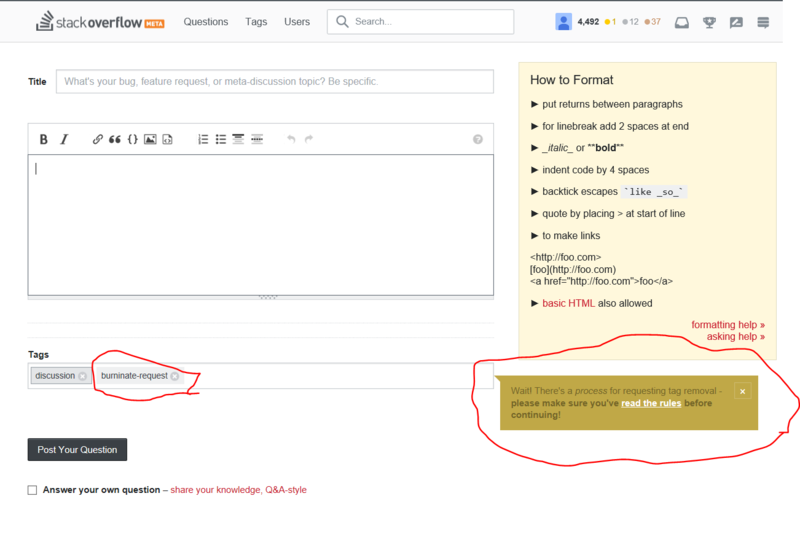 Implementing this feature could help reduce the volume of off-topic questions, which could reduce the overfilling of the close queue (among other benefits). I am in favor of some kind of additional guidance for users regarding tag usage. But I think it needs to be more context-sensitive. Even for low-reputation users, I'm not sure we want or need to be impeding them with a pop-up solely because they included e.g. the visual-studio tag. I'm not sure what the context would be for that particular tag, actually. It may be hard to distinguish in a reliably way valid uses of the tag from invalid ones. But there are other tags that are nominally mutually exclusive. I'm thinking of e.g. language tags, like java, c#, swift, objective-c, c++, etc. While not impossible, it is rare for a question to actually be about more than one programming language at a time. It would be useful, I think, to present all users (not just low-reputation ones) with a large pop-up when they attempt to add a second tag mutually-exclusive with one that's already been added, requiring them to confirm that they meant to do that and that the combination is in fact appropriate. Again, it won't be possible to do this in a way that catches all misuses of tags. And some users will always ignore whatever pop-up you display for them. But I would hope and expect that a system with this sort of cross-checking could address a significant amount of the inappropriate tagging, and would help keep the tag feeds more tidy. Tags whose description starts with "DO NOT USE" (e.g. api). Stack snippets - they're used for all and any kinds of code. Formatting - how often do you see code not indented at all, or marked up with backticks instead? These all provide evidence that there is a certain group of users, commonly low-rep, who cannot be bothered to read anything. Be that the help centre, the markup guide, the tag description, the preview of their own post, anything. There may be an arbitrary number of low-rep users who are doing everything right, but I'm pretty sure that the group we've isolated here will hardly be bothered by any kind of warning or popup. We make them inaccessible to the group that most frequently misuses them. We accept the misuse, prepare to do a lot of edits, and possibly train a bot to detect and report misuse. The question is whether we want to act in good or bad faith. Why is the close queue so much more full than other queues? How should we deal with people misusing the [Visual-Studio] and [Android-Studio] tags? Can some easily misinterpreted tags have a minimum reputation attached for use? Are ignored / favorite tags both limited to 1400? Why are so many people abusing the IDE tags? Can there be tag warnings for [android-studio] and [visual-studio]? Is there a way to clarify a commonly misused tag?